Okay, so there’s death, taxes, and last minute crazy scrambles before conference travel. I know this. I’ve known this since 1984, when I was taken to my first 4Cs [no, that has nothing to do the official anything of the Davis family]. Why I ever imagine it will be different is beyond me. Reviewing is a tedious, but serious, part of being a professional. All those peer-reviewed journals out there? Yes, the peers doing the reviewing are performing gate-keeper roles, but they are also supposed to be looking carefully at how well-constructed the arguments are, and how accurately the writers have represented their sources/their data. One day you might get to be one of those reviewers [it’s a sign your opinions matter to the rest of that audience]. But for now, you get to review each other’s work in class. The first step in this review process is to have everyone in the group read [or have someone read out loud] the Introduction/scope section of the document. Make your predictions for the rest of the paper, and write those down. What should be covered in the paper? In what order? What reason do they give for the importance of this topic? Do you think they are tackling the right sub-topics? Why or why not? Now, for each subsequent section, read, then discuss what you’ve learned from the paper. Write: Did you get what you expected? If not, what did you get instead? In either case, was the material broken into reasonably-sized paragraphs? Were there subheadings to help direct your attention? What kinds of literature were they citing, and what makes you think they have covered the topic well? If you think there are gaps, what kind of information would you like them to provide? [This is not a guarantee that they can actually _get_ that information, but it will help them to know what you were expecting!] Are there visuals [diagrams, maps, charts, data] to help support the points they are making? When you get to the end of the draft, write out what do you think of the conclusions. How well are those conclusions supported by the group’s review of the literature? What other paths might that group consider? Were there areas that went beyond the scope set out at the beginning of the paper? Should those areas be trimmed out, or should the scope be adjusted? At this point, you can take the draft apart — each group member should take a section of the paper and go over it to assess how well it is written — write on the draft and make your recommendations on how the writers in the other group could make it better. Write your name on the section of the draft that you review, so you can get credit later. MAKE SURE you get the draft, and your group’s analysis of the draft back to the other group as soon as possible! For Thursday, the groups should be able to have their own drafts back in their hands, and the task is to post a statement summarizing what you’ve learned from your reviewers and what you are going to do about it before turning in the final version next Tuesday when I’m back in town. Long before there were blogs, long before the web was populated by advertisers, I’d wanted to have an online place where a randomly-selected sentence from my fine collection of horrible student-generated sentences could sit on an animated pyre. Contributions would be welcome. We could gasp in horror at the latest form of man’s inhumanity to language. I never got around to coding the thing, and now I don’t know if there’s really a call for it. But I still remember when the denizens of the Humanities and Social Sciences graduate computer lab talked of taking the “winning” entry from the contest and using it to light the torch, which would then be run around the campus before being used to light a bonfire of our own dissertation drafts. Haven’t a clue where those former grad students are now, but there have been plenty of occasions when I’ve read a draft and thought of Montserrat Miller’s use of a great dismissive phrase: “That won’t stick together with snot!” [I think the comment was originally in Catalan, since her area of research was market stall ownership in Barcelona]. I never had to read Chaucer in the original language; I wasn’t that sort of English major. On the other hand, the multiple spellings of Rhethoric, Rhetoric, Reythorike, have always entertained me. So also, the range of pronunciations: “Re-tor-ic”, “Reh-tor-ic”, and my personal favorite, “Rey-Thor-eeKay”. There are many representations, or allegories of Lady Rhetoric. Often she is portrayed with both a sword and a lily, to symbolize her role in argument [to attack and to defend] and other forms of discourse [to embellish or beautify]. The illustration from The Marriage of Philosophy and Mercury … uses these symbols and mentions that Rhetorica is “embraced by the Zone of Justice”. Oh, is that what they called it back then? Here’s Lady Rhetoric making a point. 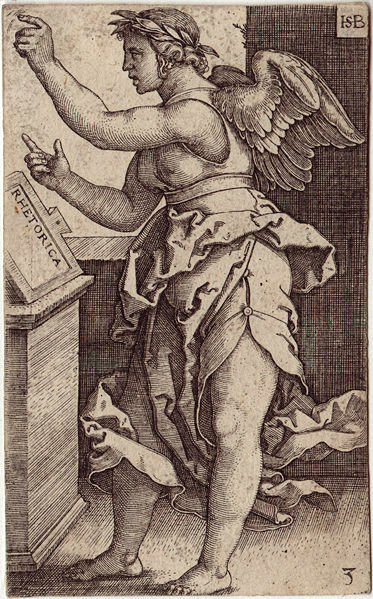 Look here for a better picture, from the cover of the splendid book, Reclaiming Rhetorica. I guess I was spoiled, living for years in a wooded area in the lee of a hill. Wind gusts of 40+ mph are fairly frequent around here. Outside the house, that means large branches from trees I don’t own become frequent projectiles. Inside the house, it means we learn new sources of draftiness on a regular basis. Many of the Elsinoreans are quiet folk. They tend their tomato plants in the front yard, they plant chrysanthemums in the alleyway. Together we retrieve the flotsam left from college students staggering back to their campuses after Thursday night pubcrawls. And then, there is the raucous revival meeting/episode of Soul Train that happens sporadically, down by the corner of OpenPit and Movie (you get one set of sounds if it’s the beginning of the month, and another at the end of the month, depending on I’m Not Rightly Sure)…. Today the shouting only went on for a few hours, and seemed to be an argument between the Resident and someone standing in the middle of the street, hefting a large rectangular object in one hand. Eventually, we came to the conclusion that this was a loud encounter of the Jehovah’s Witness kind, which raised the likelihood of the “Bible” guess being correct. We’ll see which of these, if any, actually leap into the air, like fish, and fly.